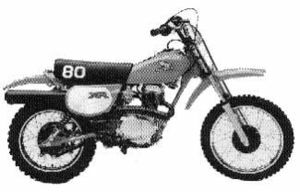 The Honda XR80 is a motorcycle produced by Honda from 1979 to 2003. 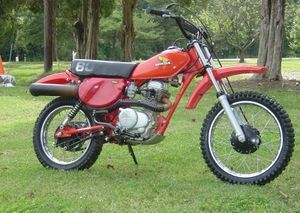 Honda XR80'79 The Honda XR80'79 was sold in 1979 and was available in one color: Tahitian Red. 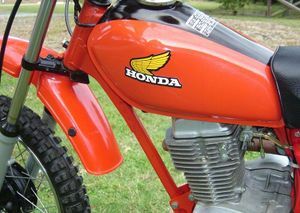 The "HONDA" fuel tank decal was red outlined in white. The seat was black without a side logo. 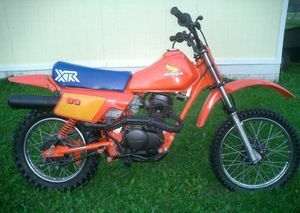 The side cover panels were black and the "XR80" logo on it was red and white. The engine was an 80cc OHC single cylinder with a 5-speed transmission and manual clutch. The serial number began HE01-5000012. 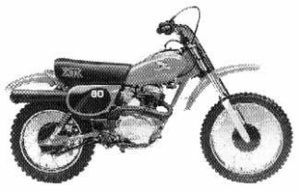 The Honda XR80'80 was sold in 1980 and was available in one color: Tahitian Red. The fuel tank decal was a yellow wing with the word, "HONDA" beneath it. The seat was black without a side logo. 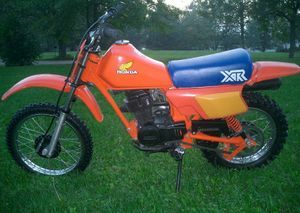 The side cover panels were black and the "XR80" logo on it was red and white. The engine was an 80cc OHC single cylinder with a 5-speed transmission and manual clutch. The serial number began HE01-5100003. 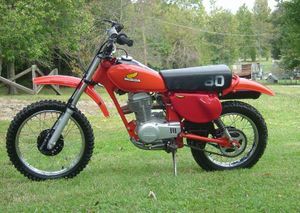 The Honda XR80'81 was sold in 1981 and was available in one color: Tahitian Red. The fuel tank decal was a yellow wing with the word, "HONDA" beneath it. The seat was black with a red "XR" logo. The side cover panels were black with a white "80" logo. The engine was an 80cc OHC single cylinder with a 5-speed transmission and manual clutch. The serial number began JH2HE0105BK200003. 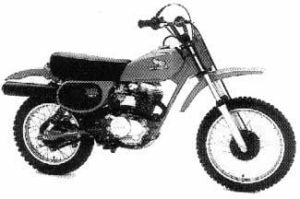 The Honda XR80'82 was sold in 1982 and was available in one color: Tahitian Red. The fuel tank decal was a yellow wing with the word, "HONDA" beneath it. The seat was black with a white "80" logo. The side cover panels were white with a red "XR" logo. The engine was an 80cc OHC single cylinder with a 5-speed transmission and manual clutch. The serial number began JH2HE0105CK300004. 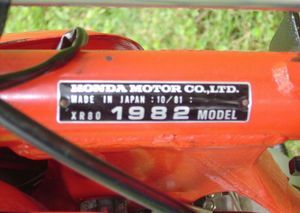 The Honda XR80'83 was sold in 1983 and was available in one color: Flash Red. The fuel tank decal was a yellow wing with the word, "HONDA" beneath it. The seat was black with a white "XR" logo. The side cover panels were yellow with a white "80" logo. There was a new shape for the fuel tank, fenders, and side covers. The engine and crankcases were now black. The engine was an 80cc OHC single cylinder with a 5-speed transmission and manual clutch. The serial number began JH2HE0106DK400004. 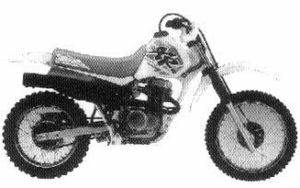 The Honda XR80'84 was sold in 1984 and was available in one color: Flash Red. The fuel tank decal was a yellow wing with the word, "HONDA" beneath it. The seat was blue with a white "XR" logo. The side cover panels were white with a red "80" logo. The engine was an 80cc OHC single cylinder with a 5-speed transmission and manual clutch. The serial number began JH2HE0105EK500001. 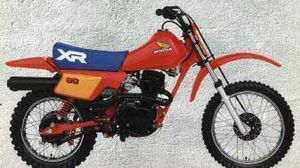 The Honda XR80R'85 was sold in 1985 and was available in one color: Flash Red. The seat was blue with a white "XR" logo. The side cover panel was yellow. The fuel tank wing decal was now red, white, and blue. 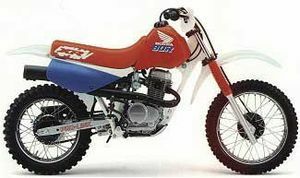 The "80R" fuel tank decal was 2-tone white and blue. The bike now had a plastic fuel tank which was shaped differently. The suspension was a Pro-Link. The engine was an 80cc OHC single cylinder with a 5-speed transmission and manual clutch. The serial number began JH2HE010XFK600001. 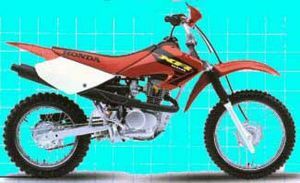 The Honda XR80R'86 was sold in 1985 and was available in one color: Flash Red. The seat was blue with a white "80R" logo. The side cover panel was yellow. The fuel tank "XR HONDA" decal was now white and red. 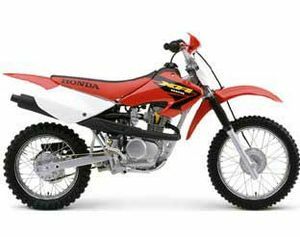 The engine was an 80cc OHC single cylinder with a 5-speed transmission and manual clutch. The serial number began JH2HE0104GK70001. 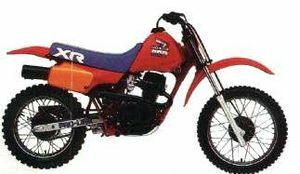 The XR80R'87 was sold in 1987 and came in just one color: Flash Red with Shasta White. The fuel tank and number plate panels were red. The fenders, frame, and number plates were white. The seat was blue with a white outline "80R" logo. The fuel tank decals were white. The engine was an 80cc OHC single cylinder with a 5-speed transmission and manual clutch. The serial number began JH2HE0109HK800001. 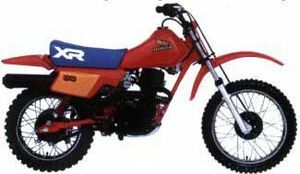 The XR80R'88 was sold in 1988 in one color: Flash Red with Shasta White. The fuel tank side panels and rear fenders were red. The front fender, number plates, and frame were white. The engine was silver and black. The seat was blue with a white "HONDA" logo. The fork boots were red while the handguards were white. The engine was an 80cc OHC single cylinder with a 5-speed transmission and manual clutch. The serial number began JH2HE0108JK900001. The XR80R'90 was sold in 1990 in Flash Red with Shasta White. The fuel tank, seat, and fork boots were red while the fenders, frame, and handguards were white. 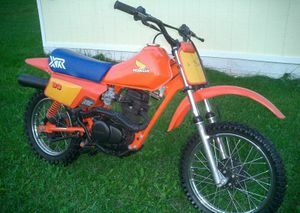 The "80R" logo on the tank and the side cover panel were blue. 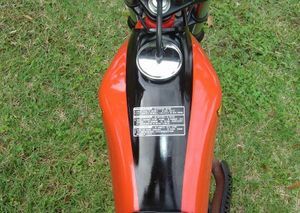 The "PRO-LINK" swingarm decal had a red outline. 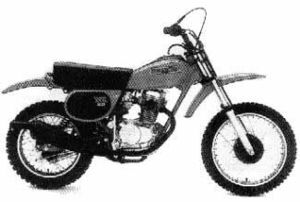 The engine was an 80cc OHC single cylinder with a 5-speed transmission and manual clutch. The serial number began JH2HE010*LK000001. The XR80R'91 was sold in 1991 in one color: Shasta White with Rainbow Blue. The seat was red while the fork boots and side cover panels were blue. The "XR" logo on the fuel tank was red and blue. The engine was an 80cc OHC single cylinder with a 5-speed transmission and manual clutch. The serial number began JH2HE010*MK100001. 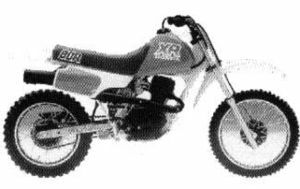 The XR80R'93 was sold in 1993 in one color: Shasta White with Rainbow Blue. The fuel tank wing logo was deleted this year. The "80R" decal on the seat was white. The points ignition was replaced with a CD ignition. The engine was an 80cc OHC single cylinder with a 5-speed transmission and manual clutch. The serial number began JH2HE010*PK200001. 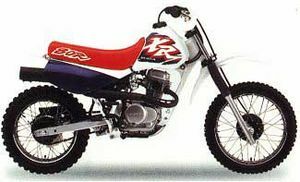 The XR80R'94 was sold in 1994 in one color: Shasta White with Rainbow Blue. 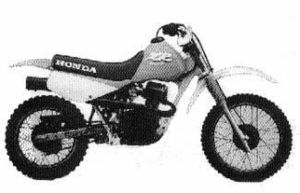 The fuel tank "XR" logo was redesigned, but the word "HONDA" on the tank was red. The engine was an 80cc OHC single cylinder with a 5-speed transmission and manual clutch. The serial number began JH2HE010*RK300001. 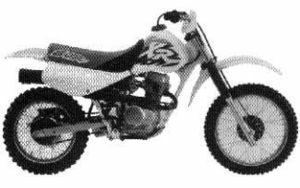 The XR80R'95 was sold in 1995 in one color: Shasta White with Violet. The fuel tank logo "XR" was red outlined in purple. The word "HONDA" was purple. The engine was an 80cc OHC single cylinder with a 5-speed transmission and manual clutch. The serial number began JH2HE010*SK400001. 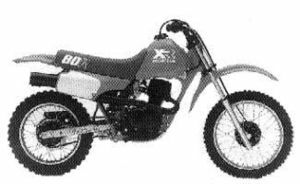 The XR80R'96 was sold in 1996 in the same color as the previous year: Shasta White with Violet. The fuel tank logo was redesigned. The "XR" tank logo was white with a red outline on a purple background. The word, "HONDA" was white. The engine was an 80cc OHC single cylinder with a 5-speed transmission and manual clutch. The serial number began JH2HE010*TK500001. 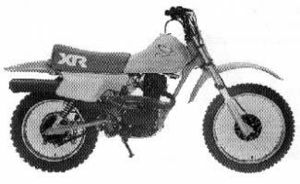 The XR80R'97 was sold in 1997 in Shasta White. The number plates were white while the seat was black and red. The "80R" seat logo was white. The engine was an 80cc OHC single cylinder with a 5-speed transmission and manual clutch. The serial number began JH2HE010*VK600001. 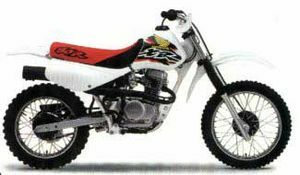 The XR80R'98 was sold in 1998 and like the previous year it came in Shasta White. The fuel tank logo was redesigned to include a yellow "HONDA" wing logo. The "80R" logo on the seat was black. 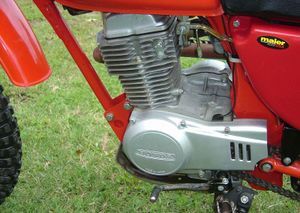 The engine was an 80cc OHC single cylinder with a 5-speed transmission and manual clutch. The serial number began JH2HE010*WK700001. This page was last edited on 28 November 2010, at 21:29.